At Curry Engineers, our structural engineering design experience is as diverse as it is extensive. We have provided design services for all types of structures from multi-story office buildings to condominiums, retail centers to industrial warehouses. Our commitment to quality and economy is second to none as is our devotion to the support of our customers. Economy, functionality and code compliance are the most critical elements in the design of all structures. We utilize the latest design and drafting software as well as proprietary design programs to meet or exceed these requirements. 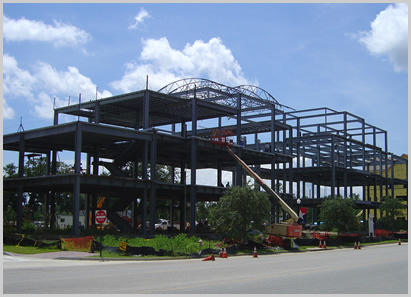 Coordination and communication are a necessity for the proper construction of commercial structures. Whether the project is Design-Build or Design-Bid-Build, normal schedule or fast-track, communication is the key to a successful project. We recognize the importance of maintaining a good line of communication during the design process with the architect, the contractor and the owner. When the project is under construction, we are only a phone call away to answer field questions so the project stays on schedule. In an age of degrading design document quality and improper coordination, our design services and coordination capabilities are a welcome change! Charleston Web Design, Web Hosting, and SEO by PalmettoSoft, Inc.